This former village school was built in 1862 on Bury Green, superseding the original National School built on The Hill in 1815. As with the church, the work was initiated by Reverend Canon Davys and the architect, Edward Browning, also worked on the restoration of the church. 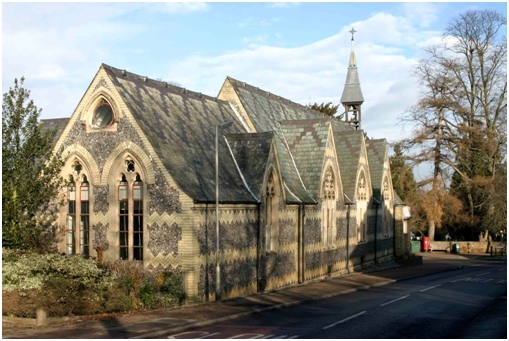 The school is built in a distinctive polychrome Decorated Gothic style, using knapped flint walling with zig-zag bands of yellow brick and a slate roof that is also in a zig-zag pattern. The school was enlarged in 1884 to take 330 children and closed in 1969. The building is now used as offices.